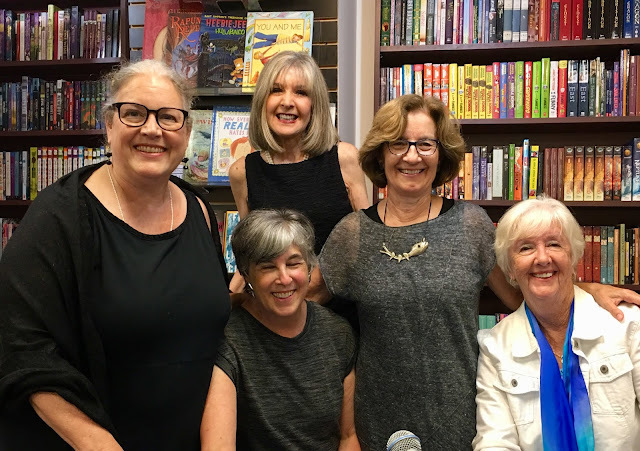 LUCY BURDETTE: FOUR FUNERALS AND MAYBE A WEDDING and DEATH ON THE MENU are launched, thanks to so many friends, readers, and fans! We had a mini-reunion of Reds at the Brookline Booksmith and a fabulous second event at RJ Julia Booksellers in Madison CT.
And now for the faux Hemingway contest--you made us howl with glee and appreciation! He was a six-toed cat who had now gone three hours with nary a bite. He was thin and getting thinner. He could feel his fur losing its luster, his orange stripes fading. Everything about him was getting dull. Except his eyes. They were the color of an elusive marlin swimming at sea, and allowed him to see in the dark of night. "Meow," he said. He touched his human's face with six, cramped toes. His human grunted and turned away, dragging the pillow over his head. The cat sat and waited. He would try again, because cats are not made for defeat. Perhaps next time he would use his claws. But he knew his human wouldn't wake until the bell tolled at daylight. He had learned long ago that when the sun rises, the human also rises. This time of year the days were short, and the nights stretched long. His stomach rumbled. He was now almost into the fourth hour of starvation. Some days nine lives seemed like a blessing. Other days, like a curse. around on her stool. It made a noise like stepping on a frog. naught of a sucker called Druff”…. Fish thrashed in the farm pond. Big fish. Hybrid blue gills. A large hand surfaced. Bigger than a fish. Blue gills all over it. Madeleine lay under the mosquito netting and watched the smoke of her cigarette curl away, each puff more languid than the last, the spirals spelling out a message of 'more'. More what, she wondered? Coffee? Cheetohs? The man (she thought of him as The man now, the last of the whiskey flaming in the fire burning away whatever had been left, the tatters of her feelings for him). The man was out in the bush again, his gun bigger than his ego, after the lion which had roared in the night, challenging him to bring his gun and new khaki shirt, his polished boots—not that he had ever done the polishing—his beaters and yes the whole damned camp to chase forever across the endless veldt in search of the one thing he could never reclaim. His soul? Or so he said. Madeleine snorted, stubbed out her cigarette and threw back the netting. For Gawd’s sake, he was a dentist from New Jersey, with too much money and no—none at all—common sense. She hoped the lion ate him. It was very late and everyone had left the Truman House except a young food critic who stood in the shadows the boxes of the storeroom made against the electric light. In the evening the house was busy with diplomats. But now the police had removed the body and the young girl wanted to get her own take on what had happened because she was curious and now at night it was quiet and she felt the difference. Her mother still in the kitchen had catered the event. She knew that the young critic was about to get in over her head. And while she was a good daughter she knew that if the girl became too involved there would be more death on the menu. "Rodrigo" said the old man. "My son, come with me." "I ?" Said the youth. "thou," said the old man. " today we face our destiny in the sun and the blood and the sweat. Today is the day we stuff the olives." the first 40 days the girl had been with her but after 40 days her parents told her she was unlucky. It made the girl sad to see each day the laundry hung without a shirt and she always went down to hand close pins. The laundry hung unfurled moving in the sodden plodding wind. A good and fine weapon senor, who is its maker? The barman reached for the gun but it recoiled when it growled at him. He sauntered in. He sat. He stared. He stared at me. He slowly blinked. And stared. He groaned. Four o'clock. Dinnertime for the dog. And our winner is Marla Bradeen for A MEOWABLE FEAST!! Please email me lucyburdette at gmail dot com with your snail mail address and we'll get those books in the mail! Thanks for the great pictures and the wonderful stories! They are all great . . . .
Yay! Thank you so much. I sent you an email. And what great pictures of your event this week. I bet it was a blast. 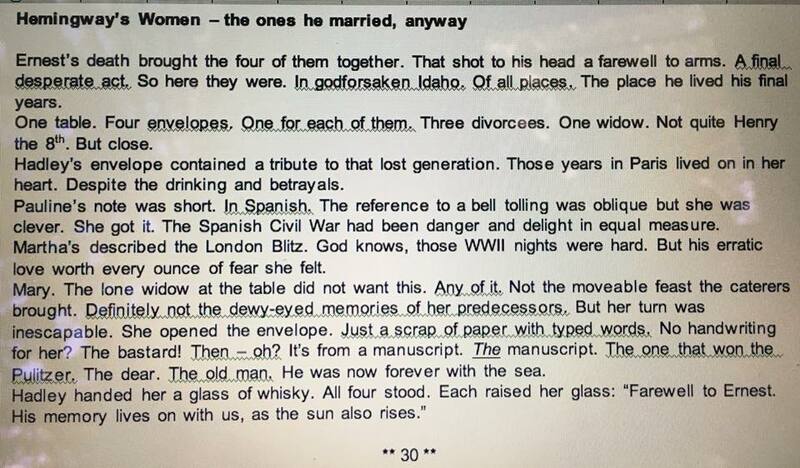 What fun those Hemingway entries were. Congratulations, Marla on your win. And, I love the pictures of you all celebrating Roberta's and Rhys' book launches. I can hardly wait to see all of you at Bouchercon and get copies signed and give hugs to this wonderful group of authors and women. Congratulations to you both, Lucy and Rhys! 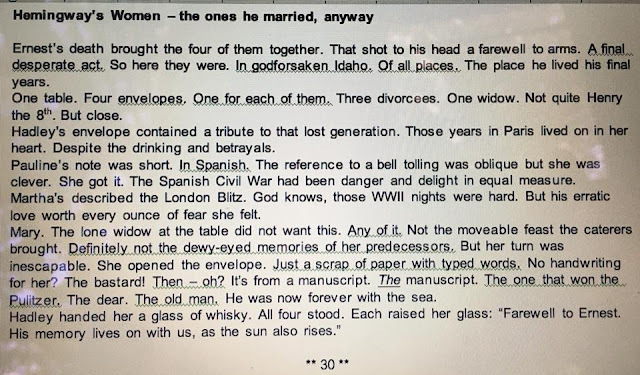 And thank you, Lucy, for including my bad Hemingway wonky screenshot submission (my phone wouldn’t let me post directly to the blog that day). Great fun to play. Well done, Marla! Happy Saturday, everyone. Thank you, Amanda! I loved your entry, by the way. Thanks, Marla. And kudos to you for providing a consolation prize! Marla, there was never any contest. Your faux Hemingway was brilliant. I and Eliot, my 24 toed cat, applaud you! Congratulations. Thank you so much, Ann and Eliot! Your entry was hilarious, even if it was plagiarized. Thanks for the laugh. It was such fun to read and reread these entries! Wish I could have been at RJ Julia but I have purchased/will purchase the books that were celebrated. She sat at the bar, nursing her whiskey like it was the last drop she'd ever have, wondering with that ennui born of loss and struggle and the fact that the cat had puked yet another morning on the rug, 'Why? Why did I lose? It was almost within my grasp!' A prize beyond anything she'd ever dreamed--riches of words could have been hers. But worst of all, she mused as she licked at the rim of her glass-to lose to a cat! Congratulations to all the players and to Marla (truth here: the boys' cats--all four of them--still love me!). And thanks for posting those pictures--what a good time was had by all, obviously!! Ooh, a bonus entry. I love it! I enjoyed your original too. I've only got two cats here, but I'm used to losing to both of them. Lucy, LOVE the photos from the events!!!! And love ALL the Hemingway entries! Congratulations, Marla, on A Meowable Feast. I laughed all day over that one. Thank you, Deborah! I think all cat owners have experienced the morning wake-up exercises at least once. All of you entrants are such good sports, and I think some of you deserve a runner-up prize. So, if you entered the original contest, have a United States mailing address, and would like a consolation prize, email me at mbradeen [at] yahoo [dot] com with your postal address by noon Pacific (3 PM Eastern) and I will send you a mystery or suspense novel from my personal collection. It might be by one of the Reds, maybe not. It'll be a surprise. And this offer is only good for four hours because that's when I head to the post office today and I don't intend to return for as long as I can put it off! Books are for sharing, right? I'm one of those people who rarely re-read, so I might as well spread the love. I'm off to the post office, so this offer is now closed. If you emailed me, I'll get back to you later tonight. Marla, you are a TREASURE! Beautiful photos! I loved ALL of the entries! How could it have been anyone else? Marla was the one to beat from the very start. Congratulations, Marla! And, my, don't all you Reds look beautiful, smart, and just flat-out awesome! 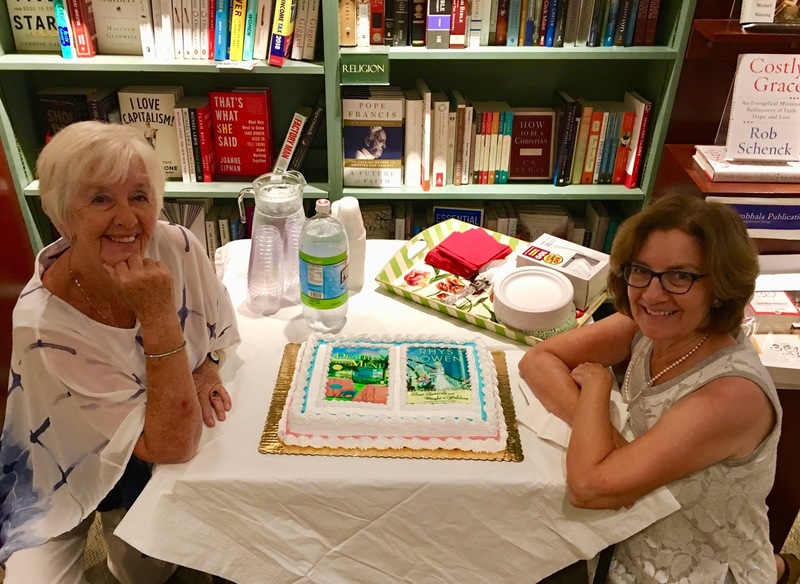 I'm glad you had such great events together for the launch of these two books. So much fun reading all the entries, and how gracious and generous Marla is to share in her glory! Lovely pictures of the Reds, what a happy occasion. Congratulations! I have to confess, I have a soft spot for Flora Church's entry. "For gawd's sake, he was a dentist from New Jersey." That's such a great picture of the Reds, and that cake! Jenn, how did we miss this?! Congrats, Marla, on your terrific entry! I know, Ingrid -- Cake!!! Y'all better save me a piece! :) Fantastic Hemingwayesque writing! Too funny. Thanks for the chuckles and a guffaw or two!